Taking a look at it now. What did you design it with? Thanks, Chip. I'll patch that up and upload a new one now. If you catch any more, please let us know. Oops. One other little bug fix with the engine sound cutting out after a big bomb. Amazing how fast you find bugs when you go live with a program! I'll have to start putting version numbers on it if this keeps up. Of course I have to comment on this. First of all, very enjoyable game, once I figured out how to play it. The gameplay is very challenging! Much more so than your previous game (which was also impressively creative, but this one more so!) My high score is 48708, and I think I made it to level 5 or so! The opening intro is great, with slick graphics and a very cool intro comic. The music is also very cool. The game concept is..... odd. In fact, it's so odd, it took me a while to figure out what was going on and how to play the game! Even with the game instructions, plus your description here, there's no way to understand just what to do until you play it a few times. Once I finally figured out how to play the game, I realized that the game concept is brilliant, and the gameplay is very fun and very challenging, but not impossible. Definite addiction factor there! I have no suggestions about the gameplay itself. It's brilliantly creative, challenging, and most importantly, fun and addictive! Once I figured it out (and I don't think I understand everything yet), I was having a lot of fun! So far, as a fun concept, the game works as is, and I have no real gameplay suggestions. The reason I'm hitting you with this criticism now is.... I CAN SEE THIS GAME BEING A HIT, especially if it is converted to HTML5! This thing could get some significant "hits" if it is converted to HTML5 (as the new special version of Gamemaker supports). Since HTML5 is in its infancy fight now, pretty much anything in HTML5 will get attention just on sheer novelty value! The "ground floor" is NOW, and this has a potential to be an early HTML5 HIT! The gameplay is RIGHT THERE! It's an actual fun, playable, intriguing, challenging and addictive game, and not just an HTML5 demo. But because of its unique gameplay, "Jeepney Jeepers" DESPERATELY needs better instructions or tutorial modes of some sort to keep players from quitting out of confusion! Ok, I'm running out of time (it's getting late), so I'll try to give some quick suggestions. The EASY way to help fix this: Instead of one page of text instructions (and one of "tips"), have several pages of instructions with actual graphic images showing the object in question.
. 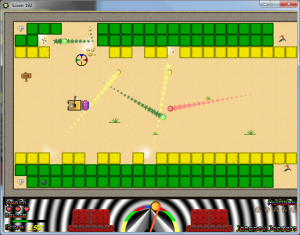 Example: Hit the green blocks (show a green block) with a green ball (show green ball with "streaks" behind it).
) to fire different colored balls. The MEDIUM way to help fix this: An "attract mode" style tutorial demo that pauses at key points, pops up instructional text bubbles with arrows pointing at relevant item. "Collect these bonus items for power-ups!" "Rescue these (arrow pointing to...) refugees for bonus points!" "Use this (arrow pointing to...) meter to determine shot color!" Etc. The HARD(er) way to help fix this: Tutorial levels (maybe the same first levels you have) that pauses at key points to pop up instructional text bubbles. This is basically the same idea as the previous "attract mode" one, except it would be interactive, sort of like the way the old Atari arcade games like "Gauntlet" did it. In summary, I think you need to "hand hold" the player quite a bit in the beginning to introduce them to this unusual new gameplay mechanic. As it stands now, it's not obvious, even with the text instruction screen, and the "WTF" factor may turn off many potential players before they give the game a chance to grab them. That'd be a shame, because the game IS fun! It works, and it has a chance to be a hit! Especially if it's converted to HTML5 for online play! 1) have the bus show visible damage as it takes hits to give a visible clue as to it's state of health. 2) more than 12 levels! I think it will be a long time before I reach the boss, but other players with more skills might breeze through this! Long term play value! How high can you try! 3) An option for "Full Screen" mode. 4) Some way to let players know what "level" they're on. I'm not exactly sure what level I reached in the current version. Anyhow, that's it. Great game! The main thing is it needs better instructions/tutorials. My other minor suggestions are just that -- minor, and not really important (or maybe wrong!). But this game has the potential to be an online HIT if you get in on the HTML5 thing now! Ok, I'm groggy and rambling. Gotta get some sleep, but one more thing. Even if you do NOTHING to the game, leaving it as is, PLEASE take advantage of Bill's offer to try to convert this game to a Gamemaker HTML5 file (making whatever tweaks you need to to get it to work) and put it online. Yeah, I suspect that many people won't figure it out, but many (like me) will persevere and figure out how to play this game. You'll still get many hits, fame, recognition, etc. P.S. I think this game would make for an excellent topic for a "Matt Chat" episode! Definitely it would be a new frontier for "Matt Chat," and I'd love to hear about the "behind the scenes" thought processes, aggravations, etc. Your fans would love it, and it may even attract new fans from the Gamemaker community! Thanks, Rob! I guess I've been so immersed in it to give proper instructions. Knocking up some illustrated instruction screens shouldn't be hard. I did think about having some text pop up, but I figured that might get annoying after the first time. The main thing is to match up your projectile color with the dial at the bottom. If it's a green projectile, for instance, it destroys green blocks but only damages the other colors. The opposite is true for shielded monsters. If the monster has a green shield, green projectiles do no damage but all other colors will. I haven't had any problems with the latest release.. I'll have more time to give it a thorough test tonight. Also, I definitely vote for assigning version numbers to the game. Im blown away.. after Matts last game I got into gamemaker again and.. my World Of Tanks playing had me designing a TANK game.. Dang you matt for releasing this so quick :) And both have tanks (i just saw this so all i have seen is screen shot (it looks ike a tank), havent played it yet, but you can bet I will tonight when i get home). Whats really got me wondring if you can read minds.. I have a WW II tank (german) but (and it will sound strange) Since i wanted to use SLOW tank shells i came up with the Idea that Hitler had found a crashed UFO and modified the gun.. the shells now travel slow but PACK A PUNCH! as i wanted my tank shooting to be skill based (carefull aim and leading of targets) .. and that sounds a bit like yours "space-age laser prototype "
The upside Mine is more standard looking, ground, buildings trees.. you know standard shooter. You look like you went a totally differnet way, something original.. Ok dang.. i want to check it out and cant as Im at work.. SJut thought it was funny tanks and space age guns.. but in the end totally different games. Ok enouhg about that.. this is for your project.. more comments when i get to play.. I hope it inspires like your first game did.. this (from Screenshot) looks quite a bit more complicated and intersting. Another update - I added a set of illustrated instructions (thanks, Rob) and also fixed another little bug that happened if you clicked the left button too fast after starting the game. Also added version number to the top right corner - this is version 1.04. Clok - happy to help however I can. I had to learn the hard way on most of this stuff since I could never seem to find exactly what I was looking for. Working out the collisions was the hardest part...Damn jeepney kept getting stuck on walls when you turned. I finally worked out to make a shadow copy of it and turn that one first to see if it hit a wall; that way I could tell the main jeepney not to turn. Then Elizabeth managed to get it stuck again! So I had to add another routine that turned you just a little bit if you got parallel right next to a wall. There's built-in routines for changing the image angle, which is nice, but it does lead to complications. The built-in collision routines work fine for round objects, but once you get oblong stuff rotating it gets complex. The functions to get something to shoot out of a barrel instead of the center of the object are interesting -- lengthdir_x and lengthdir_y. You basically work out the angle you want using point_direction and adjust the x and y coordinates with x + lengthdir_x(length, angle), y + lengthdir_y(length,angle) where length is how much space you have from the origin or center of the object to the end of the barrel. I imagine you could simplify things a lot if you put your barrel smack in the middle of your tank rather than on the back like I have mine. That required a lot more work. Darnit. Okay, one more little fix...Now when you get a speedboost you can destroy a block if you hit it at top speed.